Whenever I find a beautiful bunch of carrots at the farmers market I’m always surprised when they offer to take off the tops for me. It seems such a waste when they are perfectly edible and delicious. 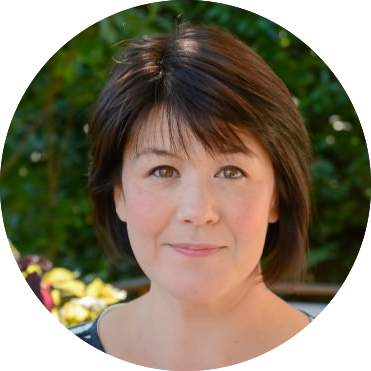 There is a lot of debate about the safety of ingesting the tops and numerous articles have been written on the subject but I have never had any adverse effects. 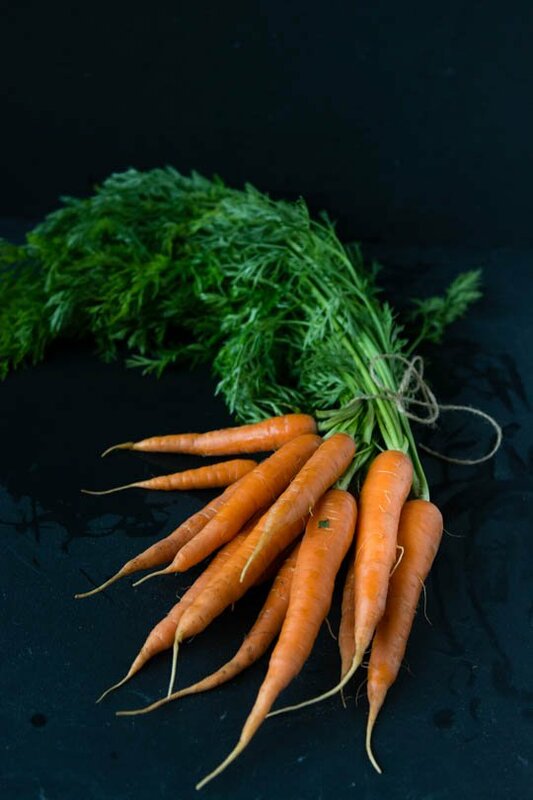 I would recommend that you try to source organic carrots and make sure that you don’t have a sensitivity to them before ingesting a large quantity. I find they have a lovely herbal, slightly bitter quality that makes them a great substitution for parsley or basil. I bought such a lovely bunch at the market this weekend that I didn’t want a single bit of it to go to waste. I roasted the carrots briefly over high heat and then made a chimichurri sauce with the tops. 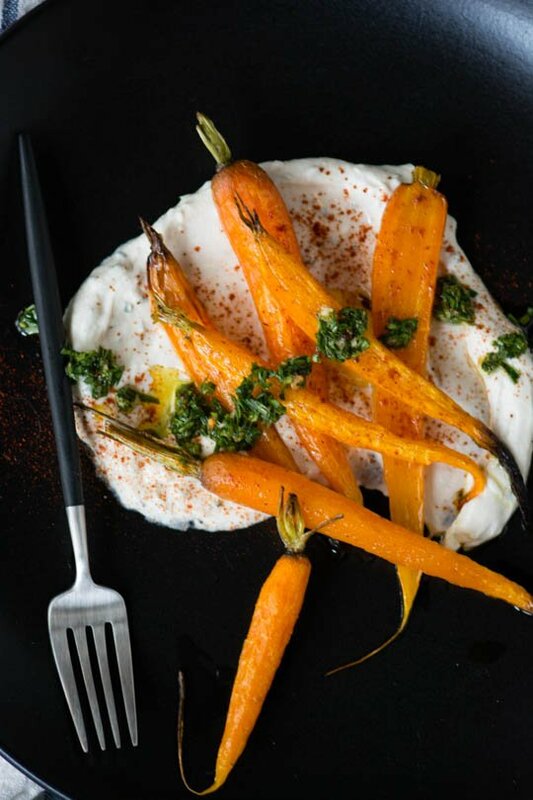 I whipped up a quick yogurt tahini sauce to act as a bed for the carrots and was delighted with the results. I ate it as a light lunch but if you would like it to be more substantial you could consider adding some chickpeas for added protein. We are still experiencing temperatures in the high 90’s and it doesn’t look like it’s going to cool off anytime soon. I think it’s time to start experimenting with some frozen treats to keep the heat at bay. Hopefully after a weekend of experimenting, I’ll have something delicious and sweet to share with you. Have a great holiday weekend! Don't throw away those carrot tops! 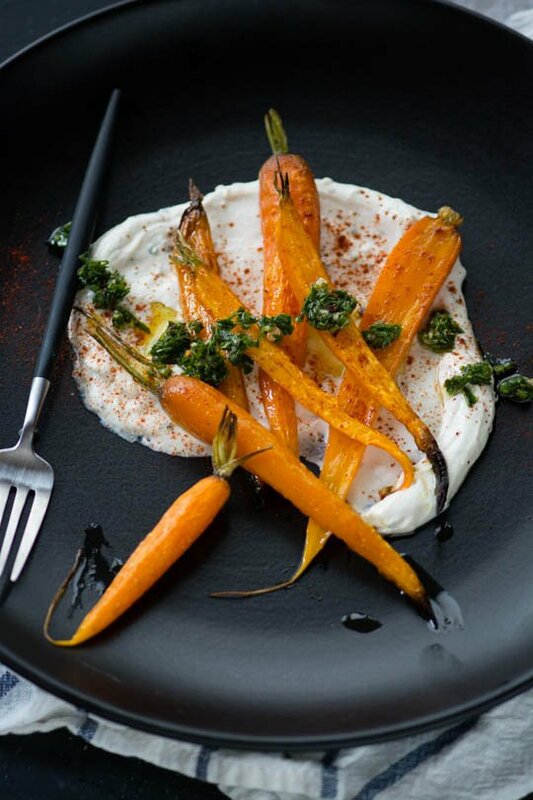 The spicy chimichurri sauce gets cooled down with the addition of a tahini yogurt sauce. Remove the tops from the carrots and set aside. Trim and peel the carrots, if your carrots are on the larger size, cut into quarters. 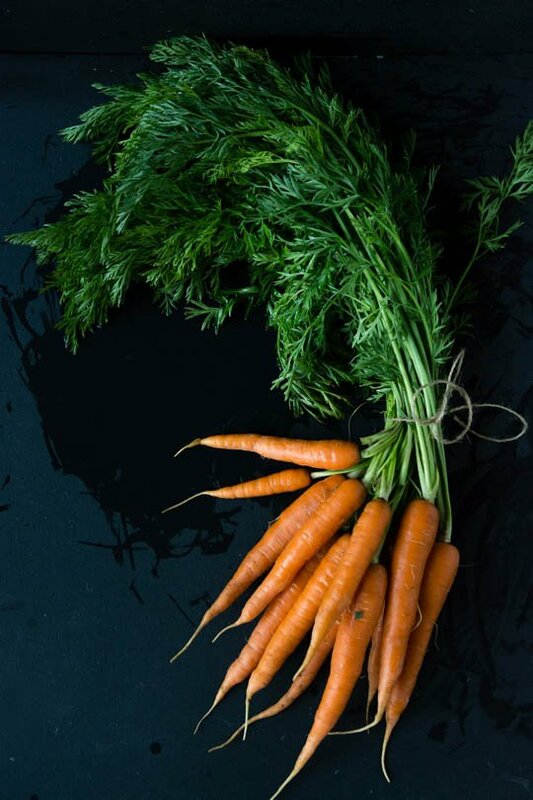 Toss the carrots with the olive oil, season with salt and pepper and roast for 10-15 minutes until the carrots start the soften and the tip of a knife easily pierces the flesh. Don't cook them to mush, you want to retain some bite and texture. Finely chop about 1 cup of the carrot greens and add to a bowl. Add the crushed red pepper, paprika, garlic, salt, black pepper, lemon juice, vinegar and olive oil and stir well to combine. Taste and adjust seasoning if desired. Combine all the ingredients in a small bowl and whisk to combine, adding a little more water to thin if necessary. Spread a few tablespoons of the yogurt sauce on the bottom of a large plate. 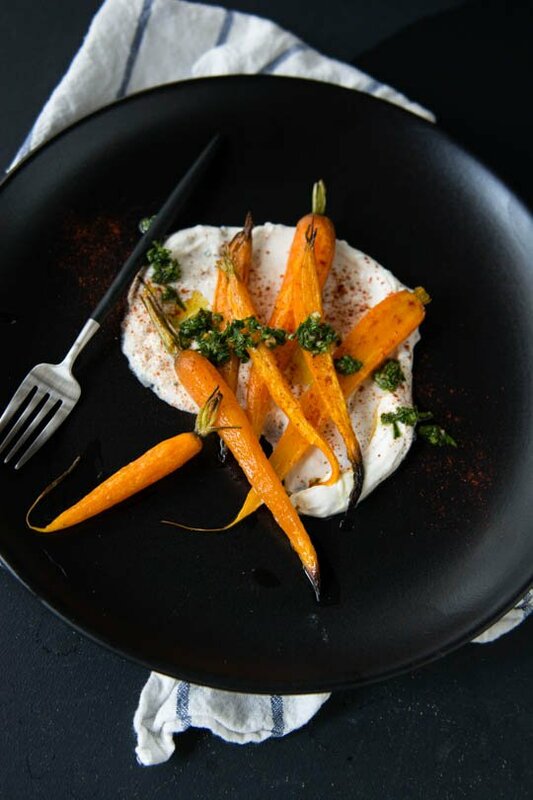 Layer some of the roasted carrots over the top and drizzle the chimichurri over the top. Garnish with a dusting of smoked paprika and serve. Notes: The chimichurri will last about a week in the fridge. Just remove it and let it warm to room temperature before serving.